Ink Global has announced that Sambro will produce Masha and the Bear merchandise for the UK market, after signing a deal brokered by Lisle International Licensing. 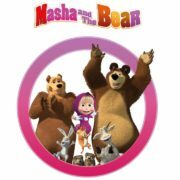 The hilarious animated hit chronicles the adventure of Masha – a lovable but endlessly inquisitive little girl – and her reluctant best friend, a circus bear whose love of the quiet life is repeatedly thwarted by Masha’s attentions. Ink Global represents the property globally in the broadcasting and licensing sectors, while Lisle International Licensing is the brand’s UK representative.